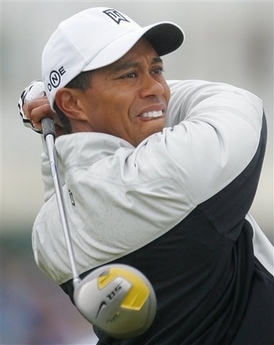 Tiger Woods shares the lead in the British Open after one day. If history is any indication, he’ll dominate the rest of the tournament, winning his third Claret Jug in a row. With his jacket zipped up tight and oversized gloves to keep his hands warm between shots, Tiger Woods got off to a strong start Thursday at chilly Carnoustie in his quest for a third straight British Open title. Woods joined K.J. Choi atop the leaderboard by rolling in a 20-foot eagle putt at the sixth hole, leaving both players at 3 under on a dreary morning along the North Sea. Woods, his new daughter back home in Florida, was trying to become the first golfer in more than a half-century to pull off an Open three-peat. Peter Thomson claimed the claret jug from 1954-56, and only three others have won three straight years in a championship that dates to 1860. Indeed. I don’t expect Tiger to win eight in a row — the game’s just too hard and the competition too stiff — but he doesn’t tend to lose Majors if he gets off to a good start.